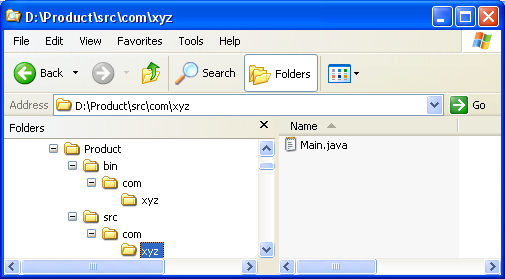 The source files for a product are laid out in one directory "src". The class files are in another directory "bin". Type "Product" in the Project name field. In Project layout group, change selection to Create separate source and output folders. Click Browse... and choose the Product directory on drive D:. Ensure that the source and output folders are detected. Warning: If the Scrub output folders when cleaning projects preference in the Output folder section of the Java > Compiler > Building preference page is checked, clicking Finish will scrub the "bin" directory in the file system before generating the class files. 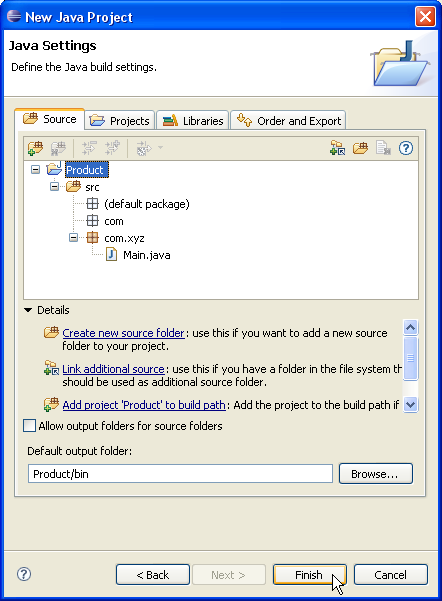 You now have a Java project with a "src" folder which contains the sources of the "Product" directory. Note: This solution creates a ".project" file and a ".classpath" file in the "Product" directory. If you do not wish to have these files in the "Product" directory, you should use linked folders as shown in the Sibling products in a common source tree section.